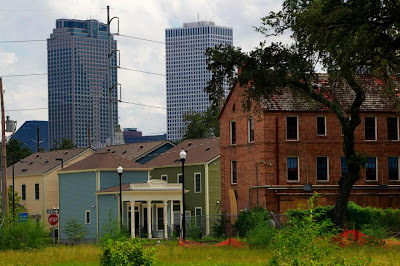 In the new New Orleans, privatized, voucher-financed housing, left, has replaced traditional public housing like the deserted Lafitte housing projects on the right. Photo by Gerald Herbert / AP. in rebuilding New Orleans, the key question is not only how much change is needed, but more crucially, who should dictate that change. In the weeks after Hurricane Katrina, the entire staff of the city’s public school system was fired -- more than 7,500 employees lost their jobs, despite the protection of union membership and a contract. Thousands of young teachers, many affiliated with programs like Teach For America, filled the empty slots. As charters took over from traditional public schools, the city became what then-superintendent Paul Vallas called the first 100% free market public school system in the U.S.
Every public housing development has either been partially or entirely torn down. The housing authority now administers more than 17,000 vouchers -- nearly double the pre-Katrina amount -- a massive privatization of a formerly public system. During this period, rents have risen dramatically across the city. The U.S. Department of Justice has spent three years in negotiations with city government over reform of the police department. The historic consent decree that came out of these negotiations mandates vast changes in nearly every aspect of the NOPD and some aspects could serve as a model for departments across the U.S. But organizations that deal with police violence, as well as the city’s independent police monitor, have filed legal challenges to the agreement, stating that they were left out of the negotiations and that as a result, the final document lacks community oversight. As the city loses its daily paper, an influx of funding -- including $750,000 just from George Soros’ foundation -- has arrived for news websites and other online media projects. In a city that is still majority African-American, the staff of these new media ventures is almost entirely white, and often politically conservative. These funders -- many of whom consider themselves progressive -- rarely notice the city’s Black media, which is continuing a tradition rooted in centuries of local resistance to the dominant narrative. These were the publications that covered police violence and institutional racism when the daily paper was not interested. There is wide agreement that most of our government services have long, deep, systemic problems. But in rebuilding New Orleans, the key question is not only how much change is needed, but more crucially, who should dictate that change. New Orleans has become a destination for a new class of residents drawn by the allure of being able to conduct these experiments. For a while, they self-identified as YURPs (Young Urban Rebuilding Professionals). Now they are frequently known as “social entrepreneurs,” and they have wealthy and powerful allies. Warren Buffet has invested in the redevelopment of public housing. Oprah Winfrey and the Walton family have donated to the charter schools. Attorney General Holder came to town to announce police department reforms. President Obama has visited several times, despite the fact that this state is not remotely in play for Democrats. Many residents -- especially in the Black community -- have felt disenfranchised in the new New Orleans. They see the influx of college graduates who have come to start nonprofits and run our schools and redesign our neighborhoods as disaster profiteers, not saviors. “Tuskegee was an experiment. We have reason to be suspicious of experiments,” says civil rights lawyer Tracie Washington, evoking a history of racist experimentation performed on Black bodies without their consent. You can hear it every day on WBOK, the city’s only Black-owned talk radio station, and read about it in the Louisiana Weekly, Data News, and New Orleans Tribune, the city’s Black newspapers. This new rebuilding class is seen as working in alliance with white elites to disenfranchise a shrinking Black majority. Callers and guests on WBOK point to the rapid change in political representation: Among the political offices that have shifted to white after a generation in Black hands are the mayor, police chief, district attorney, and majorities on the school board and city council. The population is smaller and whiter and wealthier than it was seven years ago. Even neighborhoods that did not flood have smaller populations, as single college graduates replace families. People hear the term “blank slate,” a term often used to describe post-Katrina New Orleans -- as a way of erasing the city’s long history of Black-led resistance to white supremacy. As New Orleans poet and educator Kalamu Ya Salaam has said , “it wasn’t a blank slate, it was a cemetery.” Where some new arrivals see opportunity, many residents see grave robbers. In response, those who find anything to praise in the old ways are often accused of being stuck in the past or embracing corruption. Hurricane Isaac has demonstrated that New Orleans is still at risk from storms -- although the flood protection system around the city seems to be more reliable than it was before the levees failed and 80 percent of New Orleans was underwater. But have the systemic problems that were displayed to the world seven years ago been fixed by the radical changes the city has seen? Is reform possible without the consent of those most affected by those changes? These are polarizing questions in the new New Orleans, and it may be years before we have an answer.